This was almost just another summer week. Amber has been wonderfully creative this week and has tons of projects still going. She finally made the faerie house that she has dreamed of making. Only she couldn't bear that it might be destroyed or ruined. It is now a semi-permanent outside decoration for our house. It was originally going to sit in the front landscaping, but now is sitting protected in the back corner of the porch. Amber can also check it from a front window in that location. I've been told a faerie has definitely taken up residence and enjoys the ladybug and mini-turtle friends (not real ones) that Amber placed in the home. We cleaned out the most difficult area of the basement this week and it was nothing less than a miracle to have survived... Ok, maybe not a miracle but it was hard work. None of our basement is finished, so the framed area under the stairs to the basement is accessible and makes a great, out of the way storage spot. Unfortunately, once things go in they never come out. Like Wiggles and Daffy Duck VHS tapes (we don't have a VCR anymore), three (count them) copies of Windows 98, all the left over builder grade paint from 8 years ago when our house was built, and all of our college textbooks... even the ones we have that are identical. Amber did have some fun going through my childhood keepsake bins and our wedding keepsakes (that aren't already upstairs). But after most of a day working, and creating a huge pile of recycle and donation items, I have now reclaimed that area for new items that need to be stored. It's a vicious cycle. At least it's all labeled this time. Amber's Faerie house. 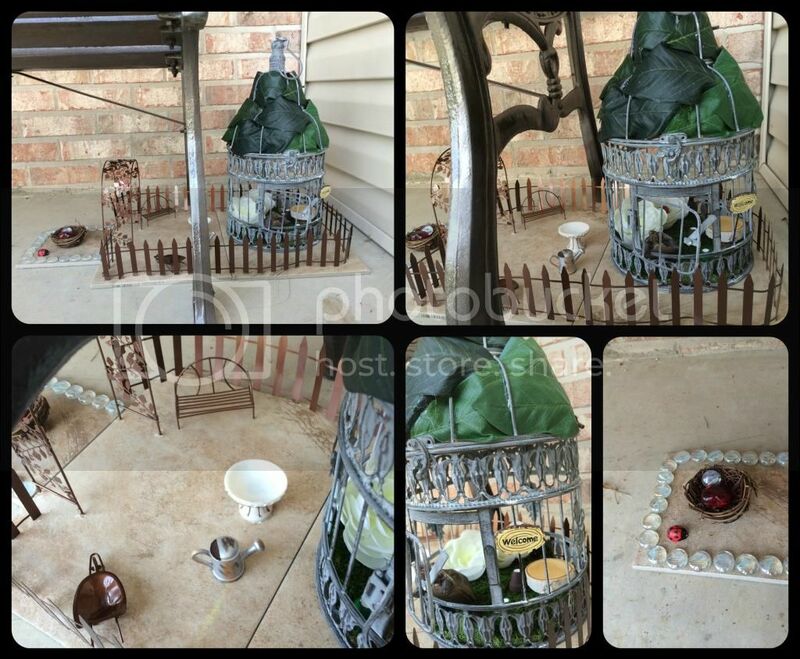 It boasts two flower beds, a wooden table, courtyard area, friendly ladybug and turtle, and a dragon egg nest (bottom-right pic). Since the basement area was cleaned, I now had a place to go with all of the random things from the guest bedroom closet. I tackled that task alone while Amber played on Build-A-Bearville. She just adores playing there, even though she is missing her friend who is on vacation. She loves giving tours as a Cy-Bear-Guide. The guest bedroom closet was home to many craft projects that never came to be, along with anything else we need a quick home for. It is still our main craft storage area for Amber, but now with only items that she might actually complete. Amber did find the Friendship Pin kits I bought on sale years ago. She spent a couple of evenings making Friendship Pins and was a bit aghast to find out I did that as a child too. Amber also finally completed an American Girl doll t-shirt design kit. We bought it before her 8th birthday to decide if this was a craft we wanted at her birthday party. We did make doll shirts at the party, just not from that kit. The thing only came with three shirts. The child is 12 1/2 years old now. Yet there was miraculously one shirt still left. 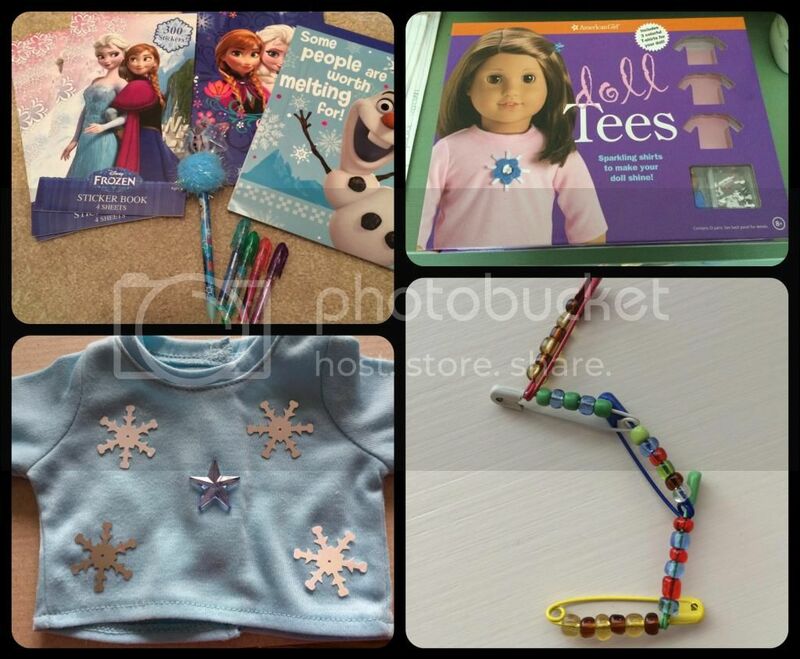 She turned it into a Frozen themed shirt for her dolls and now the kit is gone. Hallelujah. Amber's other crafty things from this week. Speaking of Frozen, Amber is still enthralled with it. While shopping two weeks ago we saw an Elsa custom American Girl doll outfit in a handmade items store at the mall. They also had an Anna outfit, but as it has hand embroidery, it was only made to order. Can you guess what Amber now has? We found that the long blonde haired Caroline doll easily doubles as Elsa and the red haired Emily doll can be transformed into a ponytailed Anna (sorry, her hair would not stay in braids). There's been lots of Frozen themed doll playing here lately. We also found some $1 Frozen sticker books and notebooks at Target last weekend. Amber has already gone through two of the 300 sticker packs and 1 1/2 of the notebooks creating Frozen themed art journal pages. Of course, she was using her $1 Frozen gel pens and sparkly, pom pom Olaf pen too. I did not do any school planning since it is all pretty much ready to go. We did do a little reorganization of the school area after moving the art supply drawers to the guest room closet, but most of the transformation into a double person area will happen as we need it. We did have progress with the adoption this week, but probably not the kind you are expecting. I will maybe be able to say more next week. 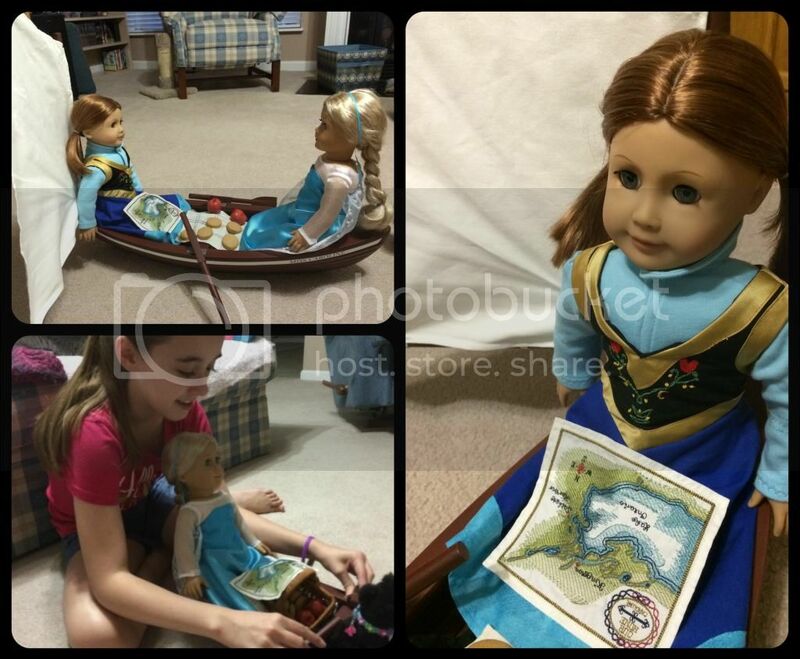 Amber's Caroline and Emily American Girl dolls dressed as Elsa and Anna from Frozen. The Anna outfit also came with the magenta colored cape, but it was cumbersome when riding in the Miss Caroline skiff. Amber did have her neuroscience visit yesterday. We are all kinda still processing what came from that appointment. I honestly thought they would listen to why we had been referred there (and why I was chastised by the GI doctor for not getting her in sooner.. even though I jumped through hoops), look Amber over and tell me that we were grasping at straws and she pretty much just has fructose malabsorption. I was wrong. 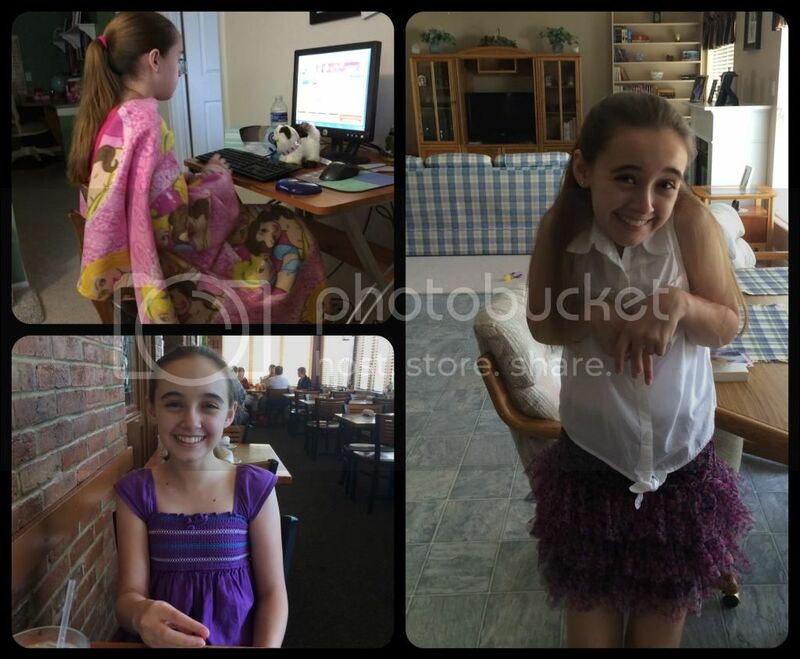 Amber has Postural Orthostatic Tachycardia Syndrome (POTS). It is a form of dysautonomia. It's really a group of disorders with similar symptoms. Kinda like IBS (Irritable Bowel Syndrome). Some testing was done yesterday and further testing is being scheduled to determine which underlying disease or condition is causing her POTS. The neuroscience doctor believes the most probable cause is Autoimmune Autonomic Ganglionopathy (AAG). All of this to say the fructose malabsorption is a side effect of another condition. Amber has a malfunction of the autonomic nervous system and it is definitely affecting her blood pressure, heart rate and digestive tract. This explains why she is so intolerant of heat and exercise lately and why she is so, so exhausted all the time. We have additional changes to Amber's life style to make, per the neuroscience doctor as way of treatment, along with being on the medical testing roller coaster again. Once we get the changes up and going I'll talk a little more about them. For now, I'm trying to figure out how to rearrange our lives, again. One positive is that there is hope for Amber to tolerate fructose some day if the underlying cause of POTS can be dealt with successfully. (TOP-LEFT) Playing on Bearville. She's not feeling too great either because of a Summer cold. (BOTTOM-LEFT) Lunch during errands at our favorite place in the historic downtown. No time to shop, but at least we could have lunch. (RIGHT) Being silly. We love to be silly. On a happier note, for our last week of summer break our nephew is coming for another 3-4 day visit. Amber is over the moon excited to have her 7 year old cousin staying. She is going to be one exhausted girl when he leaves. Thankfully, it will be just in time for a couple of days rest before school starts. This weekend I vow to finally make Amber some more baked goods. For real this time. Not like the day earlier this week when we made brownies with chocolate ganache. It was supposed to be baking day. It was instead "bake one thing" day. But those brownies were ever so yummy. What a lovely week! I love Amber's faerie house, it is wonderfully imaginative. I'm not surprised a faerie has come to stay! It is always a joy to see Amber's beautiful smile even when she is facing ill health. I too love the fairy house! I know if I were a garden fairy I would certainly love a home such as that one! I love Amber's faerie house and Doll outfit! How frustrating for you all, though with the new diagnosis and needing more testing done. Hopefully this will be the last of it and Amber's health issues can be resolved once and for all!